Originally intended for another purpose, so it’s a tad dated. Perhaps still useful to some . . .
Russian President Vladimir Putin conducted six meetings on key arms programs from 27-29 November in Sochi. He focused on strategic systems in his public remarks before the sessions. Looking first at the RVSN, Putin called development of the “main component of the strategic nuclear forces” a priority. He said two RVSN regiments received new mobile missile systems – 18 RS-24 Yars (SS-29) ICBMs — this year. 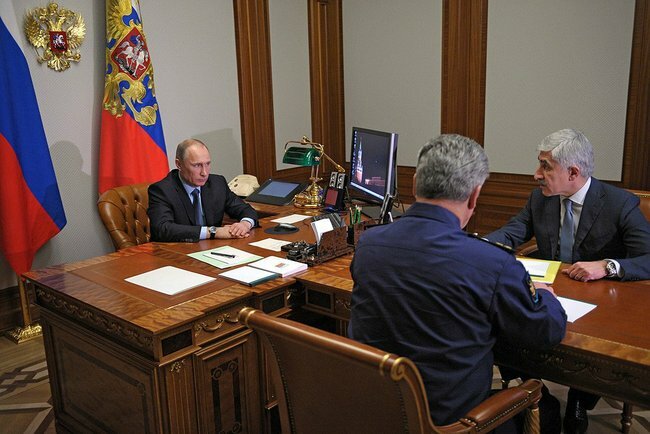 Putin added that the RVSN will field 22 new ICBMs – likely also RS-24 — in 2014. Putin said the RVSN need to overcome “any missile defense system.” Makeyev State Missile Center general designer Vladimir Degtyar responded by describing development of a missile with “increased throw weight” and better survivability, presumably a new liquid-fueled heavy missile. Putin called for “active” work on the new PAK DA strategic bomber, and modernization of existing Tu-160 and Tu-95MS bombers. OAK chairman Mikhail Pogosyan replied that the Defense Ministry has given the corporation the technical task for PAK DA, and the company is preparing for R&D starting next year. He said OAK is almost ready to submit modernized Tu-160 and Tu-95MS bombers for state testing. Turning to aerospace defense, Putin said two ‘regimental sets’ of S-400 SAMs were fielded this year, and three should reach the forces in 2014. Almaz-Antey general designer Pavel Sozinov told the Russian president that the S-500 SAM system is approaching the “finish line” with testing planned in 2014-15, and the new medium-range S-350E Vityaz should reach units in 2015-16. The first production lines in new Almaz-Antey plants in Nizhny Novgorod and Kirov will begin operating in 2015, according to Sozinov. Putin addressed well-known problems in Russia’s space sector, noting that failures have brought significant material losses. Some military space projects are drifting despite stable financing, he added. He noted that five military satellites have been placed in orbit, and five more will be in 2013. Six satellites will be orbited next year, Putin said. Concluding the meetings, Putin reminded assembled military and defense industry leaders that Russia’s defense budget has increased four-fold over ten years. He said this money was allocated to guarantee the country’s defense capability for the long-term future, and established tasks must be completed on schedule. He plans to hold another rearmament review in six months.